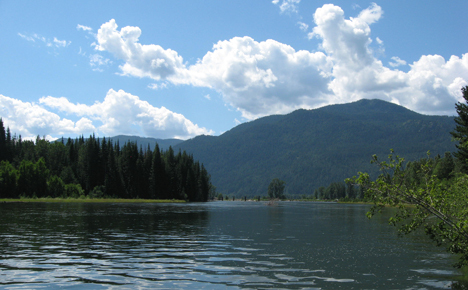 Idaho is famous for its inspiring mountain settings and commanding rivers. Bounded on all sides by land, it shares its western borders with Washington and Oregon and its northern tip with the lush, fertile farmlands of eastern British Columbia, Montana and Wyoming define its eastern mountainous border, while Nevada and Utah make up the southern edges of the state. Map image based on DEM shaded relief maps by the US Geological Survey, Flagstaff Field Center. With more than 60 percent of the state covered by forest and hundreds of miles of lakes and rivers to its name, Idaho is a recreational paradise. More than eight national forests blanket the state. Some 30 state parks are sprinkled throughout, offering the visitor a wide range of activities and attractions. Hiking, mountain biking, fishing, snowmobiling, skiing and snowboarding are among the most popular activities here, as well as scenic touring and wildlife viewing. 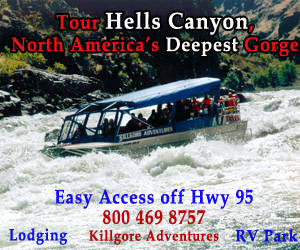 Destinations such as Hells Canyon and Craters of the Moon National Monument attract thousands of visitors every year. 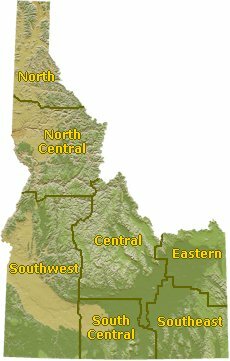 Idaho's major cities include Boise in the southwest, Idaho Falls in the southeast and Coeur d'Alene, Idaho's largest northern city. All are reachable by interstate highway. As is true in most of the Northwest, summer and early fall are the best times to experience Idaho's sunny weather and many seasonal festivals.